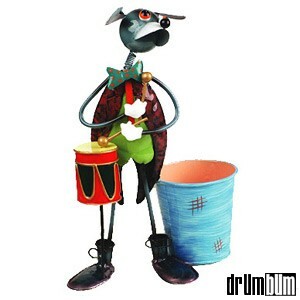 Dog Drummer Planter – If you’re looking for a wonderfully unique gift for the drummer in your life, consider this cool drum planter and work of art. This colorful item is both a decorative figurine and a practical planter at the same time! The head of the dog is on a spring which adds that much more of an artistic flair. Consider it a ‘two-in-one’ gift for your special percussionist. Size approx. 10″ x 8″. Made of metal.